Seven-year-old Khyra Ishaq was taken out of state education in December 2007. 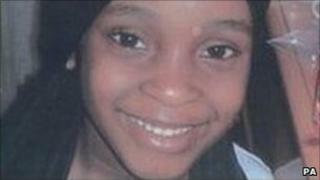 Six months later she was dead after being deliberately starved by her mother and her partner at a house in Birmingham. The serious case review into what happened said her removal led to her becoming isolated and vital attempts by agencies to see her were hampered as access became further restricted. It said her death was preventable and blamed a lack of communication between agencies and the need for better assessments. The report, released on Tuesday, said the current legislation for the assessment requirement for home education was "weak". There is "no mandate to monitor, assess or inspect the quality of home education provision once approval has occurred," it added. "This situation is particularly advantageous for parents who may wish to conceal abuse." Khyra was taken out of her school and removed from its register after her mother's relationships with schools "deteriorated" and her aggression increased towards professionals trying to check on the young girl. There are currently about 420 children or young people educated at home in Birmingham, the city council said. Currently, parents are not required to notify their local authority that they are choosing to educate their children at home and officials have no powers to see the home, the child, or the education being provided, the spokesman added. One organisation criticised in the report is Education Otherwise (EO), a department within Birmingham City Council, which gave support and advice to parents who opt to teach their children at home. The report said other agencies were hoping to rely on assessments carried out by the city council's EO but ignorance of home education legislation around those processes "clouded professional assessment and decision making". The city council said there had been three government consultations over past three years looking at home education, which made 28 recommendations. One recommendation was that designated officers should have rights of access to the home and to speak with the child alone if deemed appropriate. Following the release of the report, Education Secretary Michael Gove said local authorities needed to develop "positive relationships" with their home-educating community. "Clearly lessons need to be learned by the tragic events in this case, and I will consider the letter I expect to receive from Birmingham shortly, to see what changes need to be made to the existing arrangements, and reply in due course." Khyra's removal from school may have been a focus of the report but Hilary Thompson, who helped compile the review, said: "Home education was not the reason for her death. There were missed opportunities for better assessments." But she added: "It was made more complex for Khyra being outside the school environment." Could Khyra Ishaq have been saved?